Imagine paying millions of dollars in tax upon a successful liquidation event from your company stock… only to learn that you didn’t have to. Ignorance regarding a little-known part of the tax code called the Qualified Small Business Stock (QSBS) exemption could lead you to this big mistake. Thankfully, the QSBS exemption was designed to helpsmall businesses, and once understood, it is simply great news for entrepreneurs and those investing in early growth stage companies. So, read on, this guide to Qualified Small Business Stock could potentially save you millions. What is the Qualified Small Business Stock (QSBS) exemption? The Qualified Small Business Stock rule, also known as the Sec. 1202 stock exclusion, was designed to reward risk-taking entrepreneurs and investors who create jobs with significant tax benefits. The impact of these benefits is tremendous: QSBS exemption rules allow a company’s founders, employees and early investors to exclude up to 100% of their capital gain on a sale of company stock, up to $10 million or 10x their initial investment. Let’s look at an example to see the possible tax savings QSBS provides to owners and early investors. Remember, tax rates for capital gains are as high as 23.9%, paid on the difference between the original cost (basis) of the investment and the selling price. As we can see, the $10 million QSBS exclusion saved this owner nearly $2.4 million in taxes. In some circumstances this savings could be even larger, as the exclusion is limited to the greater of $10 million or 10x your initial investment. If an investor had put in $2,000,000 to start, for example, the exclusion could be as high as $20 million, for a tax savings of $4.8 million ($20,000,000 x 23.9%). The 100% gain exemption for QSBS is the result of Congress continuing to increase the QSBS exemption since introducing the law in 1993. Originally, only 50% of the capital gain was excluded. As such, the date that your QSBS was issued will determine the amount of gains that can be excluded from taxable income. For stock acquired before 2/18/09, 50% of gains are excluded; for stock acquired between 2/18/09 and 9/27/10 the exclusion is 75%; and stock issued after 9/28/10 qualifies for the full 100% exclusion. Is My Stock a Qualified Small Business Stock (QSBS)? The requirements for a stock to be deemed QSBS are strict. Each qualifying condition must be met, and a failure to pass just one of the below items means that you won’t qualify for the exemption. 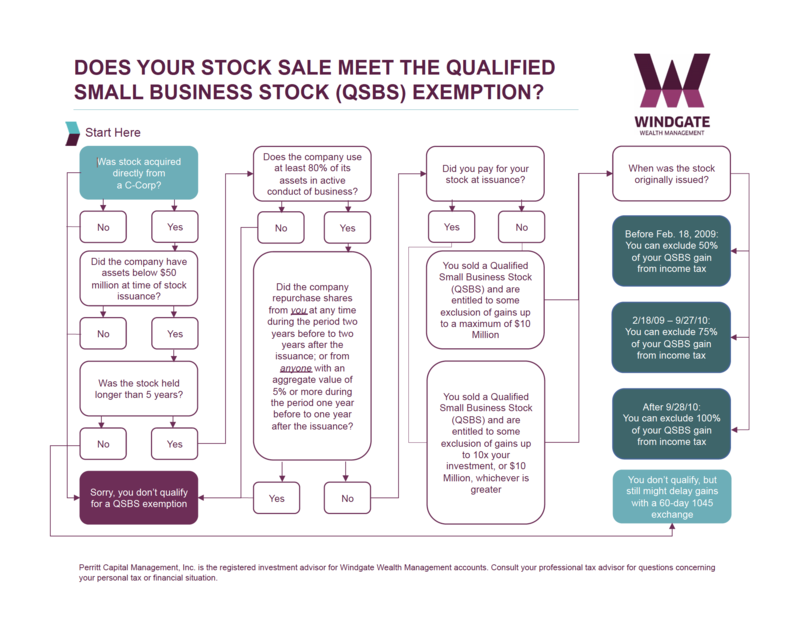 To help you navigate the maze of QSBS rules, we have created a flow chart for download: “Does Your Stock Sale Meet the Qualified Small Business Sock (QSBS) Exemption.” Follow the arrows to see if you qualify and read on for more detail of each item below. Stock must be originally issued from a C-Corporation. This applies to owners, investors and even employees who exercise stock options. Stock must be issued directly from the company – stock acquired from another shareholder does not qualify. Neither will unexercised options, so be sure to understand your 83(b) election options. The company must have $50 million or less in gross assets up until the time of stock issuance. Hence where the “small business” incentive comes in. Note that the gross assets test applies only to the company’s size up to and immediately following stock issuance; future growth does not disqualify the stocks’ status as QSBS. Stock must be held at least five years. The holding period begins on the date of issuance of stock from a C-Corp and must last five years. For stock held less than five years, investors have an ability to defer QSBS treatment if they reinvest proceeds in a different QSBS within 60 days. At least 80% of the company’s assets must be used in active conduct of business.Assets used in research or development generally qualify. Cash held for reasonably required working capital also fits the bill, however there is a working capital rule which states no more than 50% of a company’s assets can be sitting in cash. There have been no disqualifying stock redemptions. Certain scenarios when shareholders have sold stock back to the company can prohibit future QSBS treatment. The taxpayer claiming a QSBS cannot have sold stock back to the company at anytime beginning two years prior to the original issuance to two years after the issuance. This is designed to prevent the exclusion from applying when newly issued stock is simply a replacement of a previous investment. A second type of disqualifying sale includes a “significant” (generally 5% of aggregate value) redemption from anyshareholder within one year before or one year after the stock issuance. A disqualifying redemption of any type taints all stock, so none of it can be considered QSBS. In the case of departing employees cashing in their company stock, generally these transactions are not considered disqualifying. While the tax-saving benefits of properly understanding QSBS can be measured in millions, QSBS can be difficult to plan for early on. Other than establishing as a C-Corp, most small business planning around QSBS five years or more in the future will be speculative at best. However, as a company nears or begins contemplating an exit, making a QSBS analysis to plot out the right moves to reap the QSBS benefits makes obvious sense. At Windgate Wealth, we can help you analyze your QSBS situation along with a personal financial plan to help you achieve your goals. You can reach us by calling (844) 377-4963 or emailing windgate@windgatewealth.com. You can also book an appointment online here.